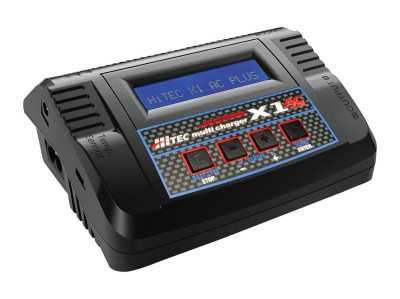 The Hitec X1 AC Plus offers a complete charging solution for novice and expert RC enthusiasts alike. Capable of charging all battery types, this charger is the affordable and portable answer to keeping your batteries charged and ready for action. The 50-watt X1 AC Plus will charge all your batteries at rates from 0.1 to 6 amps, using either 11-18V DC or 100-240V AC power sources. Designed to charge NiMH, NiCd, LiPo, LiFe, Li-Ion and Lead-based batteries, the X1 AC Plus is the perfect charging solution for your RC hobby. Drivers and pilots alike will appreciate its price and relish in its dependability..
Use it at home on AC or at the field on DC! The X1 "auto" function sets the charge and discharge current for you automatically, preventing overcharging which can damage your battery. In the event of an error, the X1 instantly disconnects the circuit and sounds an alarm once. This feature can be set by the user and controlled through the two-way link for maximum safety and minimizes these type of problems. The X1 features a built-in a cell voltage balancer so you don’t need to fuss with external balancers while charging. The X1 also monitors and balances each cell in the pack individually while discharging. If the voltage of any single cell is abnormal, the X1 will display an error message and the process will end automatically. The X1 will charge and discharge a variety of Lithium batteries, such as Li-ion, LiPo and the new LiFe series of batteries. The X1 features two styles of charging. "Fast" charge reduces the charge duration while "Store" controls the final voltage of your battery, to optimize your packs for long term storage and maximum lifespan. Our delta-peak voltage detection program ends the charge cycle whenever a battery's voltage exceeds the set threshold. Charging current can set by the user when charging NiCd or NiMH batteries. The 'AUTO' charging mode, however, is recommended when charging NiMH batteries with low impedance and capacity. The charge process will terminate if either the charging capacity or battery temperature exceeds the limit set by the user. Temperature function requires an optional temperature probe, which is not included with the X1. Protect your battery by setting a maximum time limit for charging and discharging. The X1's input voltage is monitored to protect the battery from becoming damaged. The process ends automatically if it drops below the limit. A maximum of five setting profiles can be stored for your convenience. The X1 will store the data pertaining to a program's settings and you can call up data at anytime. A battery can be cycled 1 to 5 times. This process is good for refreshing and balancing your battery. our EDN-CC-XH6S-JR Combo Balance-Charge Cord.